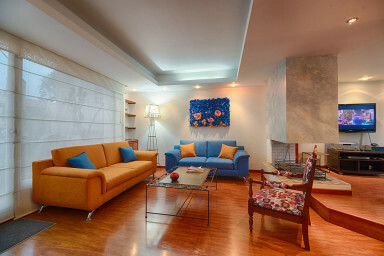 This huge 175 m2 Penthouse in a very exclusive neighbourhood, just minutes away Usaquen and 93 Park. This is a self-serviced apartment which will fit 6 guests comfortably. Guests will have access to everything seen in the pictures! Easy access to all parts of Bogotá. Close to Usquen Square, Parque de la 93, World Trade Center, Zona T, Pepe Sierra, etc. IMPORTANT: Price is currently with discount, because the Jacuzzi is not working, and terrace needs some renovation. The apartment is located by Santa Ana (Carrera 7a with Calle 106), one of the most exclusive and safe neighborhood in Bogotá. Close to the best nightlife, business area, and gastronomy zone on the city. Some minutes away from Usaquen Square, Parque de la 93, Calle 100, etc, a definite favorite among visitors to Bogotá. Everything you need for a private, comfortable, convenient and affordable stay (Wi-Fi, fully equipped kitchen, TV). 15 minute walk to Hacienda Santa Barbara and Usaquen main Square. Easy access to all main areas of Bogota.